1. I completed my first Thirty-One order today! Not enough for a party order but at least I’ve closed my first order. New catty begins tomorrow – check it out on my Thirty-One site. 2. I’m aiming to get all of my outstanding reviews written before my daughter’s surgery so that during surgery and recovery time I can focus on her and keep my other two on track with school – easier said than done. 3. I’m tired of the all the fighting, it seems all my younger two do all the time is fight – I honestly can understand why some parents have children who they homeschool and some they send to school. 4. 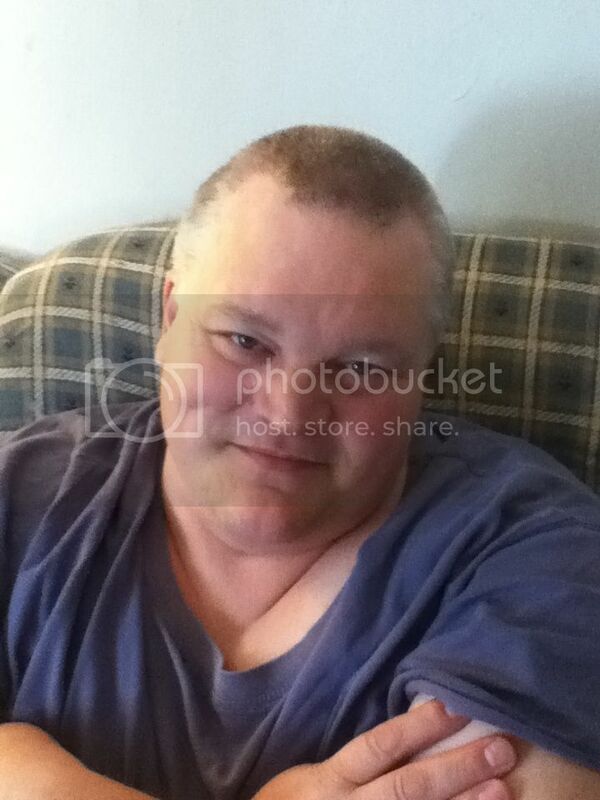 I’m so ready for my husband’s Special Olympics softball season to be over. He coaches and he’s gone a lot – which creates some stress in the house. 5. I’m so thankful for the fact that we have so many who are supporting us through prayer, as we need it and are needing it. 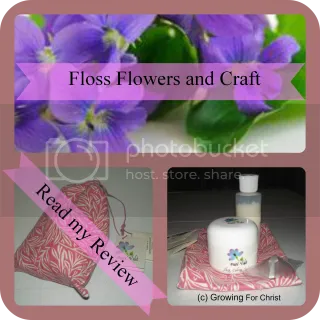 I contacted Jackie who owns an Etsy store by the name of Floss Flowers and Craft and has some lovely items that will cater to many people. The one item that I was very excited about is the Skin Cooling Lotion and the Skin Cooling Cream – both which are great for dancers, runners, fast walkers, and other athletes. Using organic all natural ingredients means it’s safe for you to put on your body and for it to be absorbed. These came packaged in a beautiful pink pull string back in which both the lotion and cream containers came in, for extra protection they were inside a small plastic zipped baggie and the cream came with a cute little spatula to use. Distilled water, Emulsifying Wax NF, Sweet almond (Prunus amygdalus dulcis) oil, Spearmint (Mentha spicata) leaf*, Aloe (Aloe barbadensis) Vera, Meadowsweet (Filipendula ulmaria) herb, Thyme (Thymus vulgaris) leaf*, Black pepper (Piper nigrum), Shea (Butyrospernum parkii) butter, Stearic acid, Menthol Also has peppermint (Mentha piperita) and juniper (Juniperus communis) essential oils. Distilled water, Vegetable glycerin, Emulsifying Wax NF, Shea (Butyrospernum parkii) butter, Sunflower (Helianthus annuus) oil, Mustard (Brassica juncea) brown seed, Purple coneflower (Echinacea purpurea), Peppermint (Mentha piperita) leaf*, Bay (Laurus nobilis) leaves, Black pepper (Piper nigrum)*, Stearic Acid, Menthol , Vitamin E (Tocopherol) Also contains: black pepper (Piper nigrum), peppermint (Mentha piperita) and juniper (Juniperus communis) essential oils. The skin cooling cream comes in a 2 ounce jar for $12.00 and the skin cooling lotion comes in 4 ounce flip top bottle for $14.00 – but they last a long time and a little goes a long way. I have to say after a vigorous workout or a 5K when my muscles are screaming at me I have my children or my hubby rub some into my shoulders and I’ll rub some into my calves and the soothing begins almost immediately. Even with the essential oils there is little to no smell, which I appreciate as I’m so sensitive to a lot of smells, so that makes this a product I can use without aggravating or bringing on a migraine or headache. Jackie also offers several other items in her shop such as hydrating body lotion, body balm for very sensitive skin, cards that are cross stitched, ornaments and more. I feel safe using the lotion and cream on my children who are into dance and martial arts and often times will get achy muscles and this helps to relax and calm them so that the muscle can repair itself for the next round of exercise. She does add 0.6% Germall preservative to her creams and lotions so that they are safe and don’t spoil and there is also a use by date on the containers. Jackie also has great customer service and will stay in contact with you the entire time of the process of your order – with Christmas around the corner these items would make great gifts for the athlete on your gift list. I’ve read the first two books, A Season for Tending and The Winnowing Season and now with the third book I feel like I’ve come back to visit some old friends and see as their orchard improves with lots of hard work. This picks up right where book 2 left off but now there is some fear of frost killing off the early budding apple trees so Samuel, Jacob, Rhoda and the others begin round the clock vigils to keep the trees from losing their fruitlings. Of course it’s not all about the apple trees and the orchard, we get to meet a new character, Iva, say good-bye (for now) to two characters, Sandra and her daughter all the while with intrigue, romance and some whimsy thrown in. The love triangle between Jacob, Samuel and Rhoda continues as the brothers try to mend their relationship and Rhoda tries to deny her feelings for the brother she truly loves – this does come to an abrupt end, but if one has read the whole series from the beginning it’s easy to see that Rhoda has struggled with this and while it seems abrupt at first it really wasn’t. I loved seeing how strong Leah has grown over the course of this series so far and that Landon is there beside no matter what she decides. I also have enjoyed seeing the new Amish settlement really start to bear fruit, both figuratively and literally, as new Amish come to see if they want to be a part of the new settlement. 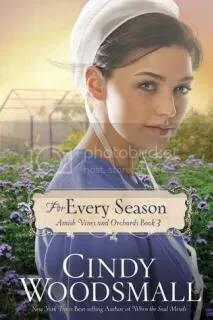 If you enjoy Amish fiction then this is one book and series you won’t want to miss, Cindy’s writing is excellent and she has a way of making the reader feel as if they were there, looking at the sunset over the fields or at night keeping fires stoked to protect the trees – it’ll feel like you’re right there with all the characters. Also in the back of this one are some recipes that sound really delicious, although I’d love to have one for that 6 layer casserole that was mentioned for dinner one evening in the book! Please rate my review on the Blogging for Books website. Thank you! 1. Labor Day (in the US of A) is approaching…what’s something you’ve labored over this year? My weight for one, I lost quite a bit then when I began getting sick from eating eggs, my protein filled breakfasts which was helping me lose weight had to go away and now with steroid treatments for a severe case of poison ivy the weight is coming back on. I’ve recently also began laboring over the fact we are preparing for my oldest to have major back surgery which is going to throw the whole house into a bit of chaos as well as working on my son with his behavior. While my first career will always be as a mom and wife my job now is just beginning – I’m an Independent Thirty-One Consultant. Well I’ve had several but I’d have to say my least favorite was the time I spent in the United States Navy. Hmm…..not sure – if I can go through a day without raising my voice or yelling I’d say I’m content but honestly I’ve had to become content with the fact our house doesn’t sell and we’ll be crowded, one way I can measure contentment is by me not nagging my husband about how tiny our house is or how cramped we are or the fact we don’t have a private bedroom. It truly depends, there are times I love a good kosher, crisp, dill pickle but there are other times the smell alone turns my stomach. I do enjoy the sweet little gherkins though. In my current city, honestly there isn’t much here – usually we have to go outside our city to find things to do as a family – either because things in our city are so expensive (the new ice rink here is going to offer $4 and $5 discount tickets, they won’t release regular ticket prices yet, but at $4 per person times 5 for a single income – well it’s not affordable) or don’t have things for the family. I’m glad that we live in driving distance (40 minutes to 1 1/2 hours) to several museums and zoos that we can visit. There is also two great libraries within 20 to 30 minutes that I frequent, our own county library isn’t homeschool friendly. Please feel free to visit my Thirty-One website and check out the online party I’m hosting now through the end of August. Well we’re nearing the end of the current Blogging through the Alphabet over at Ben and Me – can’t wait for the next round. My X is for X-ray…..
One thing as a mom of a child who has scoliosis is that that child will undergo many, many, many x-rays. No one will convince me that x-rays are safe – no matter how small or how infrequent or frequent. Yes, there are definite good reasons for x-rays but it is one medical technique that needs to be used infrequently unless absolutely necessary. Depending on which type of visit we were at the orthpedic specialist for there could be one to four x-rays taken and that was if they were taken correctly – there were times they messed up and had to be re-taken. My concern probably wouldn’t be as big if my daughter could wear the lead aprons but that isn’t an option since they have to have images of her lower spine and pelvis. I pray that the Lord protects her each time and that the x-rays she has had and will continue to have will not give her health issues later on. 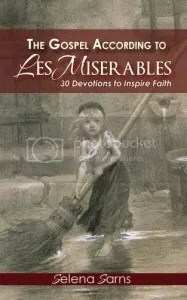 About the Book: This 30 day devotional book points out some of the many Christian themes within the story of Les Miserables, connects them to timeless truths found in the Bible, and offers challenges for all of us. You can find the book on TheBiblePeople or on Amazon. I’ve been a fan of Les Miserables ever since I read this classic tome in middle school (yes, middle school – many odd looks from peers and teachers) – I love the book, the performances, the music and most of all the messages throughout. I was so excited when I had the chance to review a copy of The Gospel According to Les Miserables: 30 Devotions to Inspire Faith from Book Crash because I loved the idea of tying Scripture to a book that has strong Christian themes of love, repentance, grace and more running through it. The first thing I noticed about this book is the Javert is spelled Javier on the back cover – however his name is spelled correctly in the inside pages. This is a short devotional since it only contains 30 readings, each with a central theme and a corresponding Scripture reference that ties the whole reading together nicely. The whole reading takes less than five minutes, which is great for this busy mom, but not so much for an in depth study but of course, one could really take the readings and run with them on their own – if they have the time. The devotions are written from an evangelical, conservative Christian stance and since I consider myself all of those the devotions resounded with me. I did find it helped to read the surrounding Scripture as well and make notes in the devotional and Bible. While some may find some of the readings repetitive I find that sometimes repetition can be a good thing – even the Lord repeats His message in His Word – some of us need that constant reminder of love, repentance and grace. I know I will be keeping this near my Bible study supplies when I need a quick pick me up based in the Word. I’m always on the watch for resources that can help my girls grow into the women that God wants them to be – having an 11 1/2 year old and an 8 year old (almost 9) – makes the responsibility very real. Doorposts has a wonderful book/Bible study called Beauty in the Heart for girls ages 10 and up. The subtitle of the book is “a study of Godly beauty for young women” and that is truly what this book/study is all about and relying only on God’s Word. If you’d like your daughter to learn what God says about beauty, attitudes and other character traits befitting a young woman of God then Beauty in the Heart is the book for that. There are 86 days worth of study in this book which equates to 17 weeks if you do five studies a week – however it could easily be sped up or slowed down depending on the girl and where they are at in their life. If more study is needed there are also 45 more guidance ideas for study that could make it a year long study. What is covered in this study? 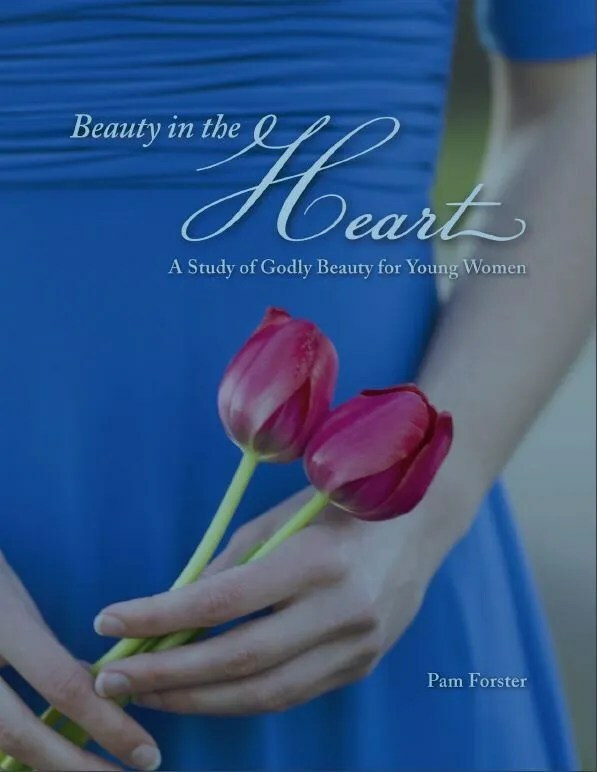 Beauty in the Heart isn’t just about 1 study but also to give young ladies (and even their moms) tools to know how to study God’s Word on their own outside of this study. Using a concordance and a topical Bible (Nave’s and Strong’s are recommended) as well as colored pencils and/or non-bleeding highlighters the young lady will work her way through different Scripture passages such as I Peter, Proverbs, and using character studies of women like Ruth and Sarah. 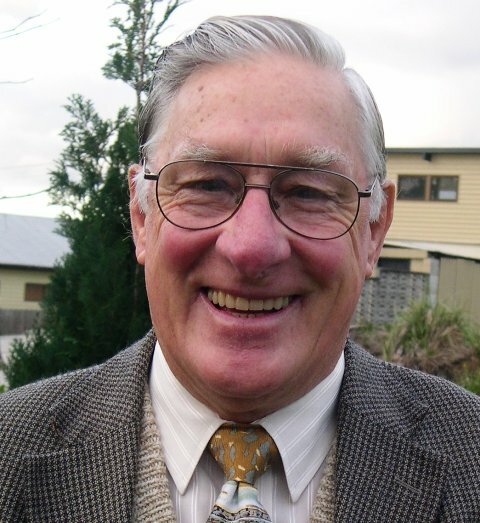 We do not have a topical Bible but in my concordance there was a topical reference which sufficed for our use – also it was nice since we only had 1 book and 1 Bible versus 2 books and 1 Bible. Also included is how to use online Bibles and mobile apps to further increase the in depth study both for this and other times. I used to hate marking in my Bible, but I now love the feeling of opening a Bible that has my markings that I know are inspired by the Holy Spirit and I can only hope by having my daughters continue working through this study that they too will come to value the priceless-ness of having a marked up Bible. Each day took between 5 and 20 minutes depending on what was being studied, how many questions, what was being read as well as how much time she wanted to spend on it. Overall, this was a beautiful study and one that I hope to go through again when my middle daughter becomes old enough. Beauty in the Heart sells for $14.00 and the truths that your daughter will find are priceless. To find out what other homeschool parents thought about Beauty in the Heart and Because You Are Strong visit the Schoolhouse Review Crew blog. I decided to bite the bullet and become a Thirty-One independent consultant! I began officially on August 15th and am so excited to get selling. I was blessed with a beautiful organizing utility tote from a friend for Christmas last year and that was my introduction to the products that are offered by Thirty-One. With 7 pockets (2 mesh, perfect for holding water bottles), light weight and wide straps the tote is perfect for our field trips to the zoo or museums or for packing books to the library! Right now through August 31st I’m hosting an online launch party – just visit my website and click on My Parties, then shop now and you can begin shopping and seeing what is available. This is the summer catalog and the new Fall Catalog starts September 1st. My enrollment kit came with lots of foundational items to get my business started like the large utility tote and the top-a-tote, which is great for carrying my supplies or for those trips to the library when a small bag just won’t work (in fact I have plans to get another one that is embroidered with ‘library’) The personalization can be as fun or as serious as you’d like and adds a great personal touch – think gift giving ideas as well. I’m also loving my skirt purse, which is light weight, stylish and stays up on my shoulder. The wristlet is also awesome for those trips when I don’t need my whole purse, my driver’s license, library cards and other important items are close to me without the worry of carrying a full purse. So if you’re looking for a great gift idea, or want to host a party (I will gladly do an in home party, an online party or a catalog party!) or if you want to begin making money on your own then look no further than Thirty-One! You can visit my personal website and also like my private Facebook page for the latest updates, to take with me about a party, becoming a consultant or general questions! If you read through my Blogging Through the Alphabet post yesterday you’ll see there have been some struggles lately that I and my family have been dealing with. 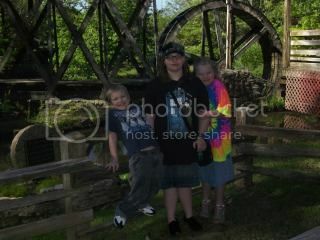 I haven’t actually posted since October 25, 2011 about my daughter’s scoliosis, at her request. I try to honor their requests in what I post about and as I was typing yesterday my daughter had not given me express permission – but she has allowed me to post about it now. Our ‘journey’ as I like to call it, because while it’s a struggle, a battle, a war, those words just don’t sound as inspiring, began in June 2010 so it’s been over 3 years and 6 braces (the brace in the picture is her first one, a night brace) of battling this monster. We caught it early because of my vigilance in not letting what doctors kept saying was a UTI go without further explanation. 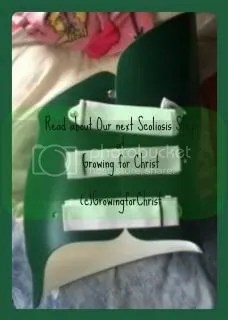 Read more about our journey by finding the links at Hannah’s Scoliosis Journey. So I won’t re-hash a lot of it because you can read the old posts I’ve written – and this one will be linked there too for anyone who needs some help from someone whose been there. I’m thankful for having two insurances, the secondary picking up the extra cost of the very expensive braces and now we are praying and hoping the same will occur for our next step. One of the verses I’m clinging too is that God has a purpose for this time – we don’t know what it is right now but He does. 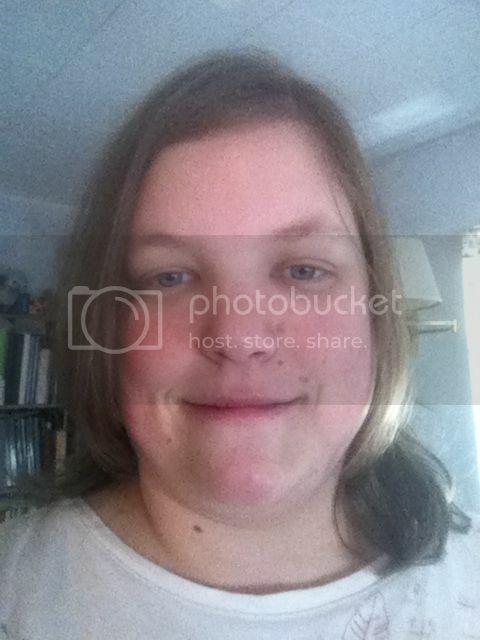 It is hard for this mom to understand that – I want to say yell “Why her Lord? ” but then I remember, He died for her, for me, for us all – He was brutally beaten and nailed to a cross – how can I possibly think our trial is anymore great that His trial? So there will be good coming of this trial, we walk through the valley, we will lean on His staff when we can’t continue on our own and He will work it to His glory. So at her appointment on Wednesday, the resident began our appointment and had some questions we hadn’t been asked before. They had already take her x-ray so they knew, the resident wanted to know if I or she had noticed anything different? We both said no. He left the room and came back with her doctor, who was not his usual jovial self. This was BAD! Well he dropped the bomb that despite 3 years of almost constant bracing her lower curve was not responding to treatment and had grown to 54 degrees. Since she has a few more years to grow, and this curve wants to get worse, it will only continue to grow. Knowing what we know now we do notice a large back bump as well as a slightly crooked walk. Some will say that ignoring the rest of the Scripture before these is wrong, but these few verses have given me much comfort before and they will continue to comfort me in the days ahead and I hope they bring comfort to my daughter as well. Given this recent development we are now getting ready to start the surgical procedures beginning with a pre-pre op in September – which will be the time the doctor will go over the details, we get to ask our questions then we’ll go for our final pre-op in October where he will re-check her curve, check her skin, we get to ask last questions and she’ll make her blood donation should she require blood during surgery. Then there will be lab work to do a few days before surgery and her actual surgery will be on October 18th. The first couple days were hard, wrapping our minds around the surgery and the risks – we are choosing to do it before her curve progresses (what parent in their right mind would put their child through this if they didn’t have too?) because there is already risk of spinal cord injury and if the curve progresses that risk becomes much higher. As a girl who love the Lord and worships Him through her dance, the fact that she retains her ability to walk and dance is of great import. We are more peaceful about this now and we know the Lord will be walking with us and we know we’ll have many faithful prayer warriors who will be backing us with prayer between now and after the surgery. 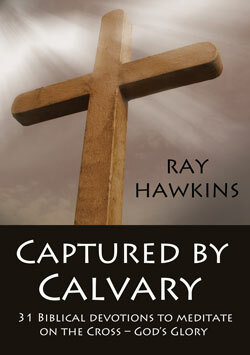 Be captured by the wisdom, power, grace and wonder of Calvary.These devotional meditations take you to the heart of the Gospel. They will fill you with awe of God. I’m still reading and will update soon.